Patty Dost, owner of Time Is Of The Es-Cents, has over 20 years experience in the corporate world. She has an extensive background as an Administrative Assistant, Human Resources Assistant, and Payroll Administrator. She also has experience in travel planning and meeting coordination. Since officially opening her Virtual Assistant business, Patty has used her background and also furthered her skills so that she can assist her clients and establish longterm business relationships. She enjoys working with small businesses and Virtual Assistants. Patty is also very excited in announcing that she is now an ABLE Virtual Associate. 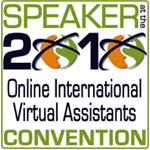 Yvonne Weld, owner of Able Virtual Assistant Services, has decided to bring in a team of Virtual Assistants suitABLE to fit your needs and selected her out of many other VAs to assist in being ABLE to meet her clients needs. With the knowledge that Patty has and the connections with other Virtual Assistants, she'll be able to assist you with whatever your needs may be or find someone that can. Take a look at the services we have to offer and then contact us for a free 30-minute consultation so that we can show you how we can support your needs.